In this crown of ten sonnets, based on the Roman Catholic Liturgy of the Hours, Malachi Black peels back each layer of his being and investigates what we are: “This tremolo of hands, / this fever, this flat-footed dance /of tendons and the drapery / of skin along a skeleton.” The tension and circularity inherent in Black’s form invokes the kinetic properties of the energy that surrounds and exists within us, and ultimately Black’s astute consideration of our condition leaves us hopeful and wanting. 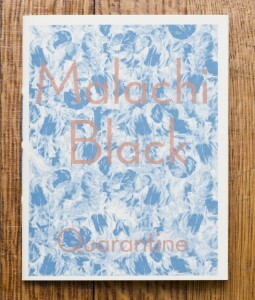 Malachi Black is the author of Storm Toward Morning (forthcoming from Copper Canyon Press), and two limited-edition chapbooks, including Echolocation (Float Press, 2010). A recipient of a 2009 Ruth Lilly Fellowship, Black has also received recent fellowships and awards from the Bread Loaf Writers’ Conference, the Fine Arts Work Center in Provincetown, the MacDowell Colony, the Sewanee Writers’ Conference, the University of Texas at Austin’s Michener Center for Writers, and the University of Utah. He was the subject of an Emerging Poet profile by Mark Jarman in the Fall 2011 issue of the Academy of American Poets’ American Poet magazine. Quarantine reviewed at Rain Taxi 9/1/2013. Posted by Elizabeth Clark Wessel, September 14th, 2012.